I wake up in the night with the word 'experimental sleeping' in my head. It is crucial to find a position that makes falling out of bed least likely. When closet door suddenly opens because of the rocking and hits against the two bunks opposite then two hands appear simultaneously from both storeys to slam it shut. Although it is sunshine in the morning we still hover along water and this will continue until tomorrow morning. If we'd stop in Ummivik then we would be stuck there for the next two days because of storm and could probably not reach Kulusuk on time. 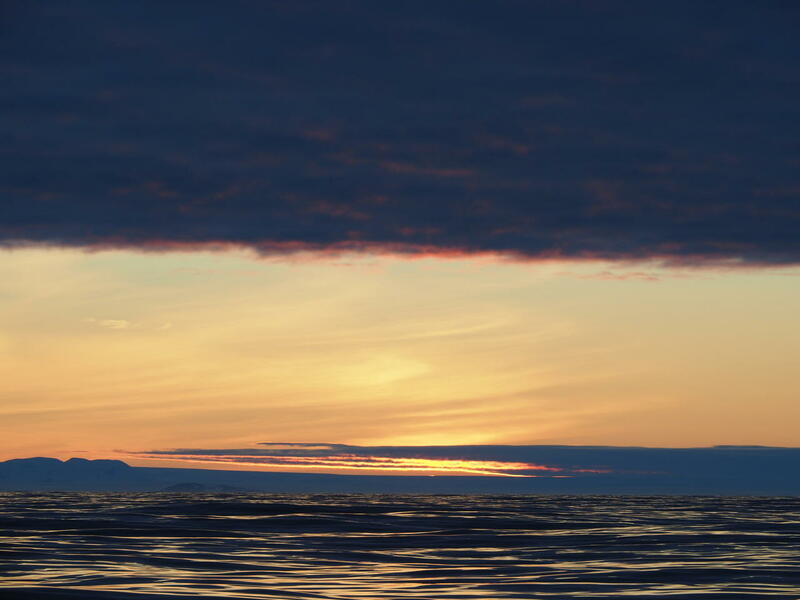 So we again only look at the dark triangle visible across water that is Kiatak mountain on Nansen peninsula at Nansen bay. Nansen also drifted helplessly past it on first attempt. It was also August then, year was 1888, there was so much ice near the coast that no ship could get close and Nansen with his companions camped on ice floes more than a week. Just a few pieces of ice now. Not really anybody turning out for breakfast and the first lunch is also not much more crowded. Later people start to appear and we drain spaghetti in the kitchen together with Veiga. All things have their place on board, everything is locked, bound, strapped or latched. Only people stumble around, reach for handles and hit themselves at corners. If all surroundings shift about aimlessly then pasta pot tries to escape and a person wanting to use both hands needs to lean on something at 45 degree angle. Next wave throws the whole composition into the other end of the room. Outside shimmers blue water, some gulls hang above it, white snowy coastline on larboard. One fin whale escorts us for a while. The wheelhouse is warm, with nice view and the book gets on well. In the evening a lone iceberg shines ahead and setting sun pours orange on the waves. We are not so disconnected from civilization as it seems. Icelandic coast guard follows our progress the whole time and Greenlandic authorities get a report of day's itinerary and planned arrival time each morning. When nothing is heard of us half an hour after the reported time, a search operation would begin. One evening they already called to ask if everything is okay.